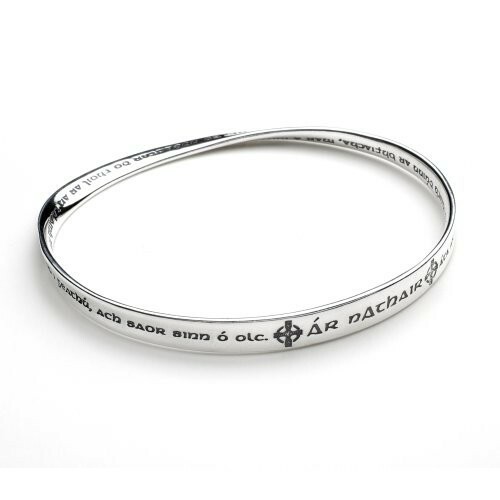 The Lord's Prayer, or Our Father, in Irish Gaelic, has been finely engraved onto this wonderful hand finished sterling silver mobius bracelet. The twisted, geometric shape is named after the German mathematician August Ferdinand Mobius (1790-1868). This means you can read the prayer continuously around the bracelet. It is here copied from the translation which was produced in 1830 and is decorated with the Irish Cross or cros cheilteach, commonly found in Ireland and popularly believed to have been introduced by St Patrick. Ar nAthair ata ar neamh, go naofar d'ainm; Go dtaga do riocht; Go ndeantar do thoil ar an talamh mar a dheantar ar neamh. Ar n-aran laethuil tabhair duinn inniu; agus maith duinn ar bhfiacha, mar a mhaithimidne dar bhfeichiuna fein; Agus na lig sinn i geathu, ach saor sinn o olc.